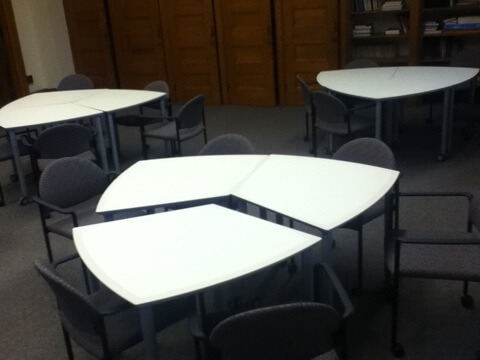 Maura 331, where I’ll spend 6 hours a week teaching has been refitted with these awesome modular tables. Our great CIT folks took out the huge, blocky, immobile PC stations. Since students have their own MacBooks and iPads, there is no reason to clutter up the space. I love the freedom this setup provides. It’s my new favorite room. There are a total of 5 three-table pods; each pod comfortably fits six. We could probably put in a sixth pod without much cramming. 23 Aug 2011 in Academia, Design, Modding, Psychology. Hi, just wondered who are the suppliers of these versatile modular tables. It is just what we are looking for at our university teaching rooms. Where did you get these tables?